Wash and peel the shrimp. Cook in boiling water with salt and pepper to taste for about 3 minutes. They should change color, but remain juicy. If they're cooked too long, they'll be hard. Strain and cool. Place the cool shrimp in a bowl with the fruit cocktail. Add the dressing and mix gently. This salad can be made in advance and kept refrigerated in a well-sealed container. Combine the mayo with the condensed milk and mustard. Add salt and white pepper to taste. The white pepper will allow the dressing to remain clean looking. You can use fresh fruit instead of fruit cocktail. You can make this salad with chopped pineapple, celery and apples. Allergic to shrimp? Use cooked and diced chicken breast instead. 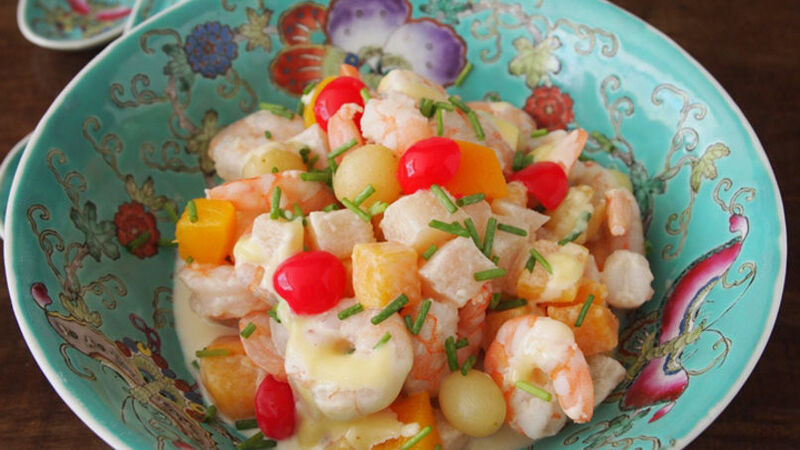 Shrimp and fruit, what a delicious combination and perfect for Easter! If you add a sweet mayonnaise dressing made with condensed milk, the result is even more delicious. I discovered this fresh salad a few years ago and it immediately became one of my favorites. Not only is it incredibly tasty, but it can also be made very quickly, especially if the shrimp are already cooked. Besides, it's a great addition to any buffet table or an Easter potluck dinner. It has an incredible flavor, beautiful colors and it's light and original! I recommend preparing this dish with small shrimps to harmonize with the small pieces of fruit. The fruit cocktail should be jarred in light syrup so that the salad isn't too sweet, since it's not a dessert. Remember to drain the fruit thoroughly to avoid a soggy salad. You can make this dish ahead of time, but it's so easy to put together that you can have the ingredients ready to be combined last minute or just before you leave to your reunion. You can also prepare a separate amount of dressing so that guests may serve themselves as much as they like. Of course, you can change the dressing for something you prefer, but I think this sweet mayo is delicious and gives the salad a unique flavor that I'm sure you'll love. Give this recipe a try and let me know how you like it, enjoy!